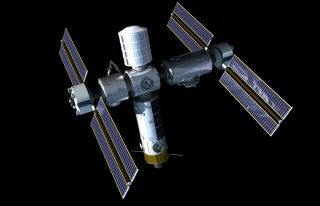 Artist's concept of the private Axiom space station in Earth orbit. The first-ever commercial space station will become a manufacturing hub just a few years after reaching orbit, if everything goes according to plan. Houston-based company Axiom Space envisions its off-Earth outpost — the first pieces of which are scheduled to launch in 2020 — initially taking the reins from the International Space Station (ISS), serving as a base for research and a destination for national astronauts and deep-pocketed tourists. "We expect that, by the 2027 time frame, manufacturing will overtake all the other revenue combined," Amir Blachman, Axiom Space's vice president of strategic development, told Space.com. Axiom Space plans to attach its first module (lower right, with body-mounted solar panels) to the International Space Station (ISS) in 2020. Axiom Space has formally existed for just 16 months, but its leaders are far from newbies in the field. Axiom's president and CEO is Michael Suffredini, who managed NASA's ISS program for a decade, and its chairman is Kam Ghaffarian, president and CEO of SGT Inc., a NASA contractor that operates the ISS and trains American astronauts. Axiom's station will begin taking shape in 2020, when the company begins launching its own modules to link up with the ISS. When the first two such pieces are aloft and attached, the Axiom outpost will be operational and capable of housing seven crewmembers, Blachman said. The company plans to launch a half dozen or so additional pieces — power and propulsion modules, for example — through 2024. The total cost of construction, launch and assembly will likely be between $1.5 billion and $1.8 billion, Blachman said. During this time, Axiom will continue supporting visitors. Some will be national (also known as "sovereign") astronauts on 60-day missions, while others will be tourists on their shorter jaunts. The company also expects to make money from advertising and sponsorships, Blachman said. "We'd like to see, with us, astronaut uniforms look like NASCAR uniforms, or modules that have companies' names on them," he said. Lab equipment inside the station could be sponsored by companies in the biomedical field, he added. When the ISS comes to the end of its life, the Axiom station will separate and begin flying freely in low Earth orbit. This milestone is currently scheduled to occur in 2024, though NASA and its partners are discussing the possibility of extending the $100 billion ISS through 2028. When the International Space Station reaches the end of its operational life, Axiom's outpost will separate and begin flying freely. Axiom will likely start generating revenue from manufacturing early on, thanks in large part to rapidly advancing 3D-printing technology, Blachman said. The company hopes to ramp up quickly, serving as a production base for a variety of big and lucrative jobs in a decade or so, he added. Not all of this space-made gear will come back down to Earth. Customers will also use the station to manufacture and deploy small satellites, at a fraction of the current cost required to launch a fully formed spacecraft from Earth, Blachman said. "The things that Axiom is doing and the things that we're doing are very, very synergistic," Made In Space CEO Andrew Rush told Space.com. "We've agreed to try and use each other's services as much as possible." For example, Made In Space plans to make the AMF available to astronauts flying via Axiom, Rush said. And the California company "will be looking very closely" at the Axiom outpost as a site for the large-scale production of high-quality optical fiber and other material that Made In Space plans to manufacture off Earth, Rush added. Furthermore, Made In Space's Archinaut technology — basically, an advanced 3D printer integrated with robotic arms — could augment or improve Axiom's station, by building external platforms or other structures, Rush added. Made In Space has also had discussions with Bigelow Aerospace, a Las Vegas-based company that plans to launch its own private space outposts — some in Earth orbit, and some on and around the moon. Bigelow's expandable habitats, one of which is currently attached to the ISS as a technology demonstrator, are made of soft but tough fabric. Axiom, on the other hand, will use rigid metallic modules built by French company Thales Alenia Space. "It's our objective and our plan to work with everybody, and to use whatever is best suited for our purposes as the systems come online," Rush said.